Tholpavakoothu or shadow puppetry is a temple art form which is prevalent in the Bhagavathy temples (mother Goddess) in Palakkad district and nearby regions in Kerala. 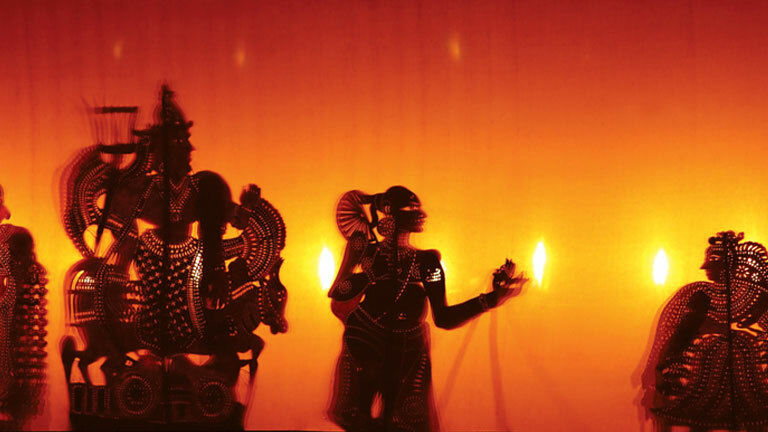 Tholppava (Thol means leather, Pava means puppet) are moved with the help of strings, and their shadows are depicted on a screen with the help of a row of oil lamps in the background. The story of Tholppavakoothu performance is from the Indian epic, Ramayana. In the olden days it was performed elaborately over a period of forty-one days. The narrative used for the performance is a mixture of prose and poetry called Adalpattu. Tholppavas are made of the skin of deer and the puppet forms are made by making small holes in the leather that is then attached vertically to a bamboo stick. Accompanying instruments include Ezhupara, Chenda and Maddalam. The artists have to undergo several years of rigorous training to master this art form. The puppetry is staged on a special structure in temple premises called Koothumadam.